Red Bean Espresso has been open for two-and-a-half months now with a steady stream of traffic says the chatty barista as I order a latte. On this day, however, the space is empty. Inside, there are hues of white and green. There are cool grey accents here and there, a couple of photos by local artists hanging on the walls and a decorative, um, slab of wood hanging from the ceiling. 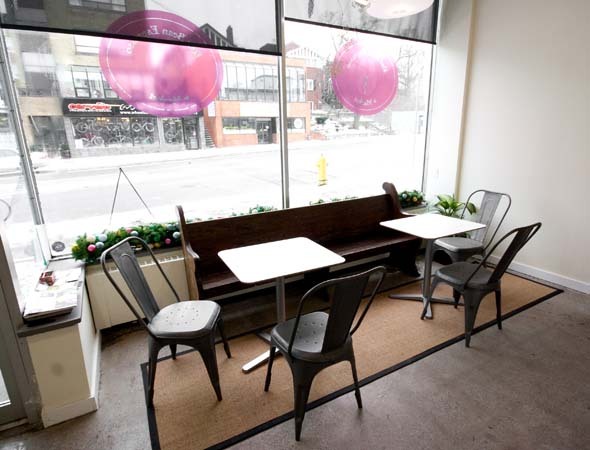 But, despite the cafe's colourful name, not a touch of red is to be found in the clean, open-concept space. After taking a seat, I try their latte ($2.95 for 12oz). The espresso stands up well against the milk, there is a hefty head of microfoam and it is served at the perfect temperature. That said, I wish Red Bean took up latte art, as nothing is more appealing than a beautiful Rosetta or heart design atop any crafted beverage. 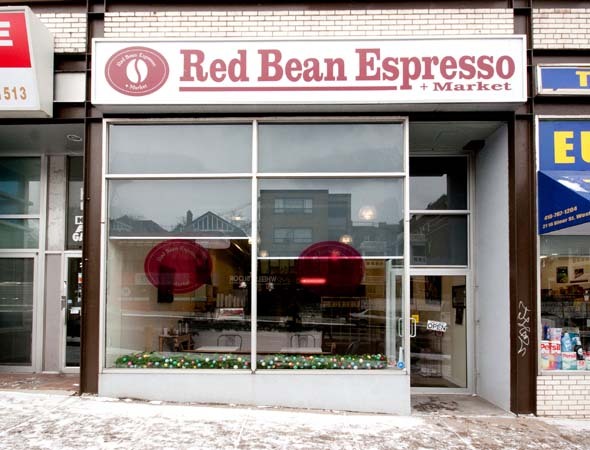 Red Bean also sells your regular cafe beverages including Americanos ($1.75 8oz, $2.50 12oz), cappuccinos ($2.64 8oz, $3.65 12oz) and mochas ($3.40 8oz, $3.65 12oz). 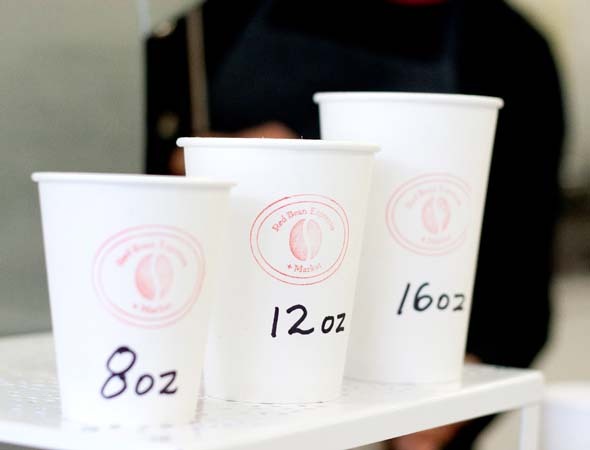 A single shot of espresso is $1.50 and a double is $2.25 while tea costs $2 for 12oz and $2.25 for 16oz. Soy and almond milk is also available for an absurd price ($.50 8oz, $1.00 12oz, $1.50 16oz). 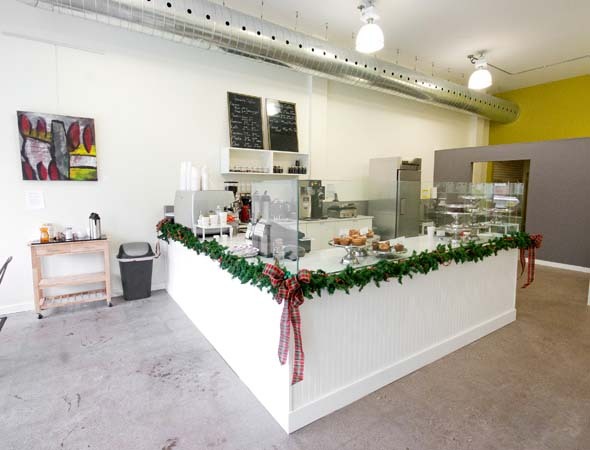 After my latte, I order a cream cheese filled mini pumpkin loaf ($2.50). The mini loaf is very moist with a crunchy exterior and although the baker could have had a heavier hand with the cream cheese filling, the loaf is delicious. 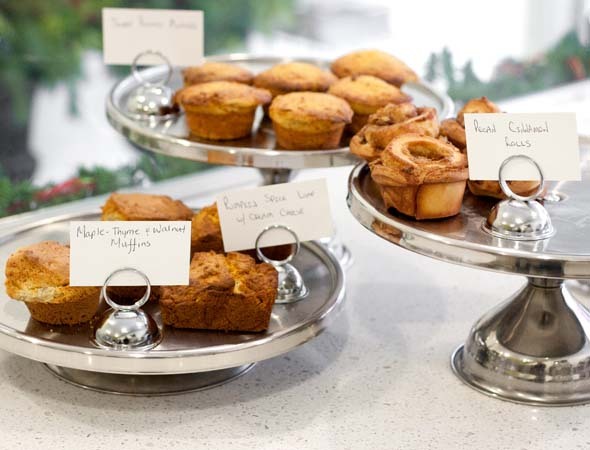 For the most part, Red Bean's pastry case is filled with muffins, mini loaves, cookies and other popular baked goods, prepared and baked in-house except for a few specialty cookies shipped from Europe. For lunch, there is a selection of panini ($5.75) and soups ($3.75) available. To my surprise, the cafe is closing early on this particular visit so I can't order the espresso shot I want to try. That said, a closed-down espresso machine doesn't stop me from checking out the "market" in the back of the cafe. 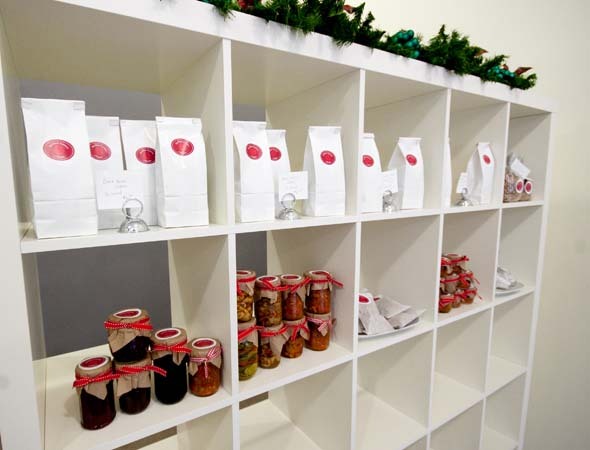 Aside from a few mason jars of different antipasti and a few paper bags of hard candies and/or marshmallows, this part of the cafe is, well, a little barren. With WiFi being installed soon (why wait months after opening?) and specialty days throughout the week (Mommy and Me Mondays as well as Toonie Tuesdays), I have a sneaky suspicion Red Bean Espresso could do well, provided it gets its hours of operation in order and does away with the soy milk surcharge .